Use in all 2-stroke and 4-stroke carbureted and fuel injected gasoline engines. This including cars, trucks, motorcycles, ATVs, snowmobiles, marine engines, lawn mowers, chain saws, weed eaters, and snow blowers. Prevents rust on internal engine surfaces during storage. 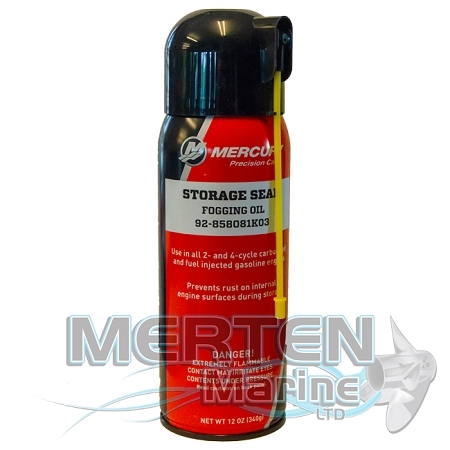 Mercury Storage Seal forms a protective barrier that prevents rust on internal metal surfaces. It also keeps cylinders lubricated to prevent cylinder or piston damage when starting your engine after storage. Securely insert a plastic tube in the spray head nozzle. Slowly spray Storage Seal directly into air intakes so it goes into the engine. After 15-20 seconds, spray heavily to stall engine. Remove spark plugs and spray for 5 seconds into each spark plug hole.